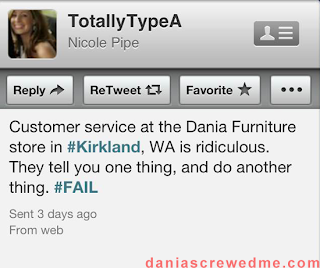 How Dania Furniture Ruined My Life Forever: Dania Furniture in Kirkland, Washington is A Store You Probably Shouldn't Solicit, Because We're Assuming it's Bad. This blog is idiotic. I've had nothing but good experiences at Dania. Well, Unknown, very bold of you to make such a harsh comment. Prove to us that you aren't afraid to reveal your identity by telling us your name, address, the last four of your social, and your mothers maiden name! Do something better with your time.... get a job that compensates you for your idiotic waste of time. You stand no chance at the art of persuading... look at what you waste your time on ... time to get a job. 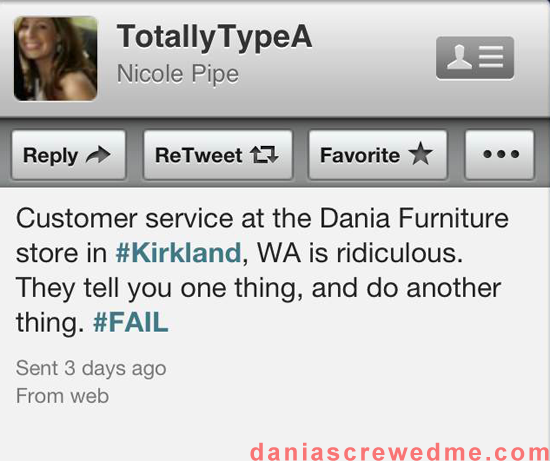 Actually i love this blog and it is true Dania furniture is absolute rubbish. Whilst all the time your in the store they try to make you feel your attaining a higher social status for particle board! And we love you, too, Alyssa! Wow, we're all rose-cheeked over here after reading your wonderful words of validation. We want you to know we are working hard to make sure your love of this blog is sustained.